Iron Man 3 is a crazy, gutsy sequel. Once it gets going, its penchant for zagging instead of zigging is welcome relief from the typical strain of sequelitis. There are three things that make Iron Man 3 (for what it’s worth, Iron Man Three is displayed in the end credits) particularly interesting and exciting: current events, technology, and the “Shane Black meets Christopher Nolan” effect. If thought of as a Venn diagram, where those three areas intersect is ground zero for really exciting filmmaking. The story gets off to a seemingly jumbled start, including pre-studio logo voiceover comments from Tony Stark. It feels like the movie’s searching for a tone, maybe even a whole new direction. Indeed, Jon Favreau has relinquished the director’s chair to Shane Black while Favreau serves as an executive producer and returns to his role as Tony’s bodyguard, Happy Hogan. Could it be Iron Man’s gotten a little rusty? Has the series lost its way in this third chapter that also serves as a follow-up to last year’s Avengers get together? Come on now, true believers. That restless, directionless vibe actually turns out to be an immaculately executed part of Shane Black’s plan. Might as well discuss that “Shane Black meets Christopher Nolan effect” right here, right now. Black was the wunderkind writer behind Lethal Weapon. His was a rising star that skyrocketed so high so quickly there was only one place to go: down. And it happened in spectacular fashion, as the highly-hyped Arnold Schwarzenegger flick Last Action Hero landed with an ear-ringing thud. But, 8 years ago, Black made his directorial debut with an inventive little crime comedy called Kiss Kiss Bang Bang. It starred none other than Robert Downey, Jr.
Black’s first collaboration with Downey also has that same disorganized start, but it’s also clearly part of the joke. The movie’s playfulness proved Black still had a great ear for dialogue and a fluency in the language of the moving image. All things considered, it makes sense that Black would share some of the same storytelling sensibilities as Nolan. Here, with Iron Man 3, Black follows one of Nolan’s key tenets in the genre: nothing is sacred. As with the Dark Knight trilogy, though, to say any more would be to spoil the fun. It’s enough to say the approach put to work here in the Marvel universe makes for an exciting movie. Iron Man 3 dips its iron toes into the muddy waters of current events by way of a new villain wreaking havoc in America. The Mandarin (Ben Kingsley, Hugo) is a terrorist with an agenda; he cites atrocities committed against Native Americans in 1864 Colorado among other issues on his hit parade. He’s out for retribution and he does so by destroying a major Hollywood landmark, the Chinese Theatre, in a bombing incident that seemingly involved no bombs. 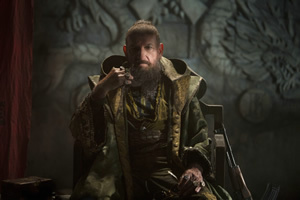 The Mandarin’s madness is presented in a gritty style that feels a bit like Zero Dark Thirty. He commandeers TV channels nationwide to broadcast his message of terror; the imagery and sounds all keenly in tune with what puts Americans on edge these days. As the storyline with The Mandarin begins, it feels like Iron Man 3 wants to exorcise the demons of terrorism and put current events squarely in the safe confines of the Marvel universe. But The Mandarin turns out to be merely part of a much bigger plot and his character arc goes off in a dramatically different direction from what would typically be expected of a villain. The knee-jerk reaction is to want The Mandarin to be the usual, cut-and-dry, black-and-white bad guy, the very same personificaiton of evil that is easy to identify—to put a name and a face to—as Bin Laden and Gaddafi. Marvel purists might be put off by this movie’s take on The Mandarin, but taken as a movie with its own agenda and its own need to put things in a contemporary context, what Black does, with co-writer Drew Pearce, works as a textured spin on what the world is grappling with today. Much like how some people follow false gods, some people get wrapped up in an ideology and follow an evil that is a facade for something completely different. That bigger plot involves genetic experimentation and the use of wounded warriors as guinea pigs in carrying out terrorist acts. This element, at least right now, in 2013, feels the most like pure, old-school comic book science. There are other technologies at work in Iron Man 3, though, that seem much more prescient and actually fit in nicely with The New Digital Age, the new book by Google’s Eric Schmidt and Jared Cohen that takes a look at where technology might be in the near future. One key scene shows Tony Stark investigating the theatre bombing location via a life-size 3D hologram. Such a possiblity is discussed by Schmidt and Cohen; it’s a nice splash of the almost-real to mix with the more far-fetched element of Tony’s beating heart, pumping thanks to a mechanical widget he pounded out in a cave back in the first movie (all the way back in 2008). All of the above dovetails into a very personal story for Tony as he grapples with his need to protect the love of his life, Pepper Potts (Gwyneth Paltrow, Country Strong). The Mandarin’s mayhem gets personal for Tony when Happy winds up in the hospital following the theatre attack; in the heat of anger, Tony invites The Mandarin to his house for a face-to-face confrontation. He does so on TV, offering up his complete address. And it’s an offer The Mandarin accepts in violent fashion. Ooops. Once Iron Man 3 hits its stride, it’s a mighty fine ride. One incredible action sequence involves a free-fall rescue of Air Force One passengers after the plane is hijacked (by the way, President Ellis (William Sadler, Die Hard 2) bears a striking resemblance to President George W. Bush). It’s a “barrel of monkeys” stunt that’s followed by a jarring sight gag that comes out of left field. The worm hole in The Avengers is a jumping-off point for Tony’s frazzled state of mind and it serves as both a plot point embedded deep within Iron Man 3 as well as a source of friendly cross-franchise jabbing. The encounter with space aliens has left Tony unnerved and, as Happy puts it, Tony’s been too busy with the Super Friends to have time for his mortal buddies. What Tony’s been through is surely enough to make even the noblest of heroes seek therapy. And Tony does. For him, sharing the events that unfold in Iron Man 3 is a 130-minute therapy session. Be sure to stay through the end credits.